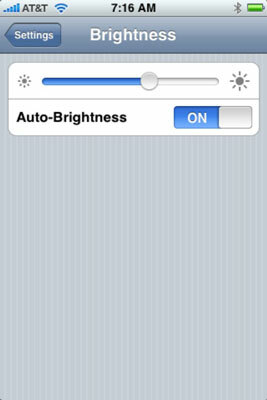 You can manually or automatically set the brightness on your iPhone to match the ambient light conditions. Who doesn’t want a bright, vibrant iPhone screen? Slide this control to adjust screen brightness. Alas, the brightest screens exact a trade-off. Before you drag the brightness slider to the max, remember that brighter screens sap the life out of your battery more quickly. It’s good practice to tap the Auto-Brightness control so that it is On. It adjusts the screen according to the lighting conditions around the iPhone while being considerate to your battery.